WINSTON-SALEM, NC -- (MARKET WIRE) -- March 19, 2007 -- On April 17, 2007, 5pm EDT, Wake Forest University Baptist Medical Center surgeons will demonstrate a Birmingham Hip™ Resurfacing procedure live on www.OR-Live.com. Wake Forest Baptist is the first hospital in the Triad to offer a new type of hip surgery that is an alternative to standard total hip replacement. Approved by the Food and Drug Administration in May, the Birmingham Hip Resurfacing System is designed to remove less of the patient's bone than traditional hip replacement surgery. 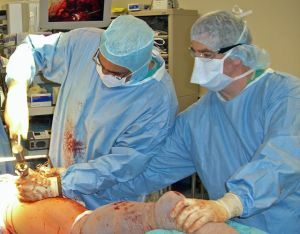 William Ward, M.D., Professor and Director of Adult Reconstruction, and Riyaz Jinnah, M.D., Professor of Orthopaedic Surgery, were trained in Birmingham, England, to perform the surgery. The procedure was introduced in Europe in 1997 and there have been 60,000 implantations worldwide. "This is a breakthrough in total hip surgery that allows hip replacements to be performed in young and active patients and allows them to participate in sports activities without the limitations imposed on standard total joint patients," said Jinnah, North Carolina's most experienced surgeon in this procedure. Total hip replacement and the new resurfacing surgery are both designed to reduce hip pain and stiffness that develop in such conditions as osteoarthritis, rheumatoid arthritis or injuries that cause the joint to become rough and worn, resulting in pain, swelling and stiffness when the bones rub together. With traditional hip replacement surgery, the entire ball of the hip joint is removed and replaced with a smaller metal ball. The new procedure, known as resurfacing, preserves more of the patient's bone because only the surface of the joint's ball is removed to implant a new metal surface or cap. The other part of the system is a shallow metal cup that replaces the damaged surface of the hip socket. The cap moves within the cup -- just like the hip's ball and socket joint. The surfaces that rub against each other are made from a highly polished metal. The result is a more normally shaped joint. Research has shown that joints with two metal components wear better than traditional replacement joints made from metal and plastic. The metal-on-metal system has been shown to eliminate the problems of proximal femoral stress shielding and osteolysis caused by plastic wear debris associated with traditional hips, virtually eliminating the problems of hip dislocation and significantly reducing the problem of leg lengthening. Ward said bone conservation is also a significant benefit of the system. Saving natural bone is important in young, active patients who want to resume sports activities and who may need additional surgeries later during their lives. Because the procedure is relatively new, there is no long-term data on patients. However, results to date indicate that the success rate of hip resurfacing after the first five to 10 years is better than those of conventional total hip replacement. Candidates for the resurfacing surgery are people under age 55 with hip arthritis or very active people over age 55. Birmingham Hip™ Resurfacing System is a trademark of Smith & Nephew. 'This is a breakthrough in total hip surgery that allows hip replacements<br> to be performed in young and active patients,' said Jinnah, <br>North Carolina's most experienced surgeon in this procedure.